You won't see it in the headlines. It won't be the talk of your next cocktail party. No one cares... And that's actually a good thing. Last year, headlines focused on the return of volatility, trade wars, and the brutal decline in stocks. No one was paying attention to another area of the market that ended the year strong. And they still aren't. This is a big mistake. Because this forgotten corner of the market is setting up to be a major winner in 2019. Importantly, one particular asset just did something rare... which means big gains are possible over the next year. While stocks ended 2018 with a plunge, another asset class soared. When an asset moves higher several days in a row, it's often a sign that the trend is accelerating. It signals that more upside is likely. Silver had been trudging along. But that changed in December. The metal absolutely soared... And it jumped for seven straight days in the process. Silver has returned just 3% a year since 1975. That poor return doesn't mean you should ignore the precious metal, though. Buying after consecutive up days tends to mean a strong uptrend is underway... And big gains have followed in times like these. Precious metals were the silent winner in the final weeks of 2018. The trend is up in both gold and silver. And that means now is a safe time to buy. Silver is especially poised for a strong year. And the simplest way to own the metal is through the iShares Silver Trust (SLV). SLV is an exchange-traded fund designed to capitalize on moves higher in silver. It's an easy way to gain exposure to silver without worrying about buying and storing the physical metal. Most folks haven't noticed the boom in silver. But history says what we've seen is likely just the beginning. Double-digit gains are possible over the next year. And that makes owning shares of SLV a smart bet now. "I love to see this setup," Steve says. "It's the kind of sentiment extreme that contrarian investors dream of." Get the details on another potential opportunity in precious metals right here. 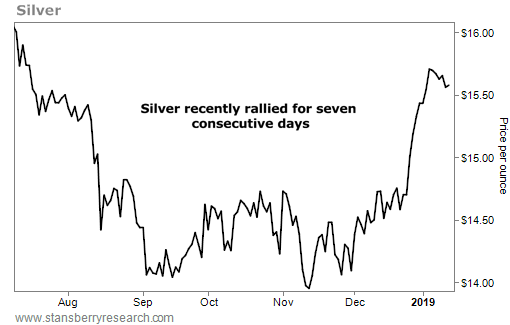 Back in November, Steve shared one of his favorite sentiment indicators and what it meant for silver in the months ahead. Learn more about how to use this indicator to your advantage here: Extreme Pessimism in Precious Metals Points to Triple-Digit Upside. Longtime readers know we’ve compared telecom companies to toll-bridge operators. After making a big one-time investment to build the bridge, the toll-bridge owner gets to collect the tolls indefinitely… Similarly, telecoms invest heavily in infrastructure, then sit back and collect the access fees. 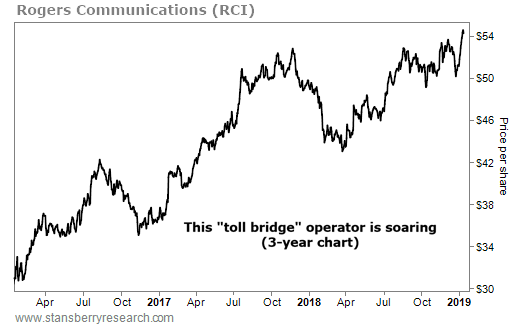 Rogers Communications (RCI) is a perfect example… The communications and media giant is Canada’s top wireless communications provider, serving nearly 11 million wireless subscribers. Rogers calls the Internet a “lifeline” for Canadian citizens… And it plans to play a key role when 5G – the next generation of wireless communications – takes the stage. In September, Rogers struck a multimillion-dollar deal with the University of British Columbia. Together, they plan to build a 5G hub as an early step toward a Canadian 5G network.